We will soon be publishing a five-part article based on the remarkable diaries of Surgeon Captain Robley Browne. Robley Browne was born in London on August 4, 1863. 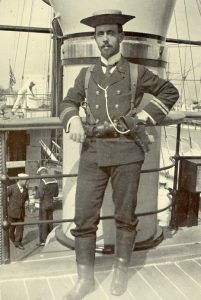 After six years of medical training at Guy’s Hospital, in London, from 1882 to 1888, he joined the Royal Navy, where he spent his first two years on board training ships. For the next thirty years, Robley led an extraordinary life in the service of his country, as surgeon on board a number of ships. The posts will be themed on the taking of the Taku Forts in 1900, Robley’s fascinating experiences of naval sporting events, Robley’s service on the Royal Yacht, his travels in Kroea, China and Japan and finally on his post-war life as a surgeon on Ocean Liners. His diaries are rich with important historical detail and are a joy to read, and they are all illustrated with images, maps, sketches and photographs.